30 October 2009 - Mazumbai Forest, East Usambara Mountains, Tanzania. Mazumbai Forest is one of the last pristine Montane Rainforests in Tanzania. It was the first day of a three day hike. You can read all about the hike here. When you do a jungle hike, always make sure you pack your camara, macro lens and a fully charged ring lamp for the macro lens :-) Well. That's what I do. I don't travel light. I travel with a day pack of 9 to 11 kilo's. Of course some water and food. 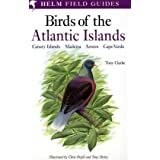 But also wild life guides. Those heavy books that proofed to be valuable on the road. I think I'm one of the few that makes sure his ring lamp is fully charged in the jungle. Let alone: if you already have such a ring lamp to light your macro subjects. I've used the ring lamp several times in the dark jungle. Very valuable! So we were walking there. On our way to the Swiss House. A company of 5. A German couple, a Spanish guy that loved every bug and creature just as much as me, yours truly and our guide. So. When you see a very interesting bug. That is actually not a bug - back then I had no clue - but an insect in Coleoptera order or beetle. Then you have to take a photo. 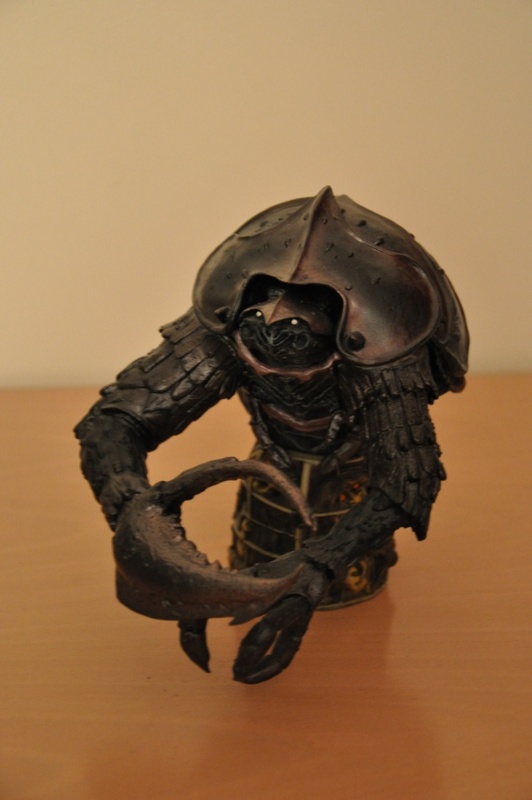 I think it was even the Spanish guy that pointed out this pretty shiny Scarab with it's armour with spines. How long can you stall the rest of the group? It turned out to be a minute or 6. The rest already moved on. Close to the destination as they were. I could catch up easily. Lying on my knees on the broad sandy path, surrounded by a hill with century old jungle trees and the slopes down to the valley on the other side, not far from some cultivated land. Crawling with your lens, the ring lamp on. Trying to get focus. But the depth of focus is only a few millimeters and my crawling movement may be a bit more. There was a challenge. I did not have to worry about any cars or other people that might pass by on that road. There were none. We were probably the only white people in a week or 2 or 3 in that area. And there were not many locals going there as well. But I got my photos. Love them. Actually. Love the beauty of this tiny creature. It's a Dung beetle (Mestkever). Beautiful, metallic green shine on the thorax. And of course some spikes. It looks like a tank. Can't help but to see a similarity with the bombarding giant beetle tanks in the movie Starship Troopers and the Garthim in The Dark Crystal. The only thing is that I don't know the precise species. I'm not all that knowlegeable with insects. 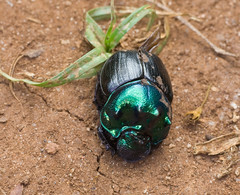 So I managed to narrow it down to a Scarab, a Dung Beetle (Mestkever). Most likely a dung beetle in the Scarabaeinae subfamily. See also the biological classification at the bottom. If you know any more details about the genus or species, please leave a comment on the blog or preferably at Flickr! Click a link and you'll go to the Flickr photo page for that rank in the biological classification. 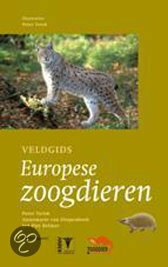 Or have a look in the 'Find wildlife photos' menu item on the left. 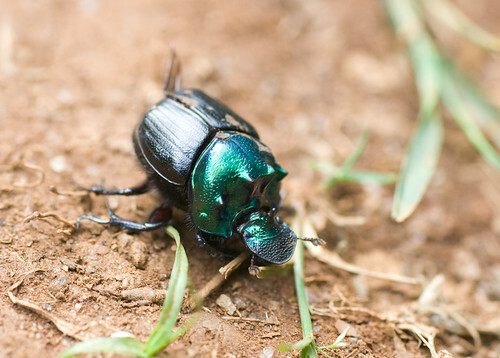 Suborder: Polyphaga; Scarab Beetles, Lady Beetles, Click Beetles, Rove Beetles, etc. / Mestkevers, Kortschildkever-achtigen, Kniptorachtigen, etc. 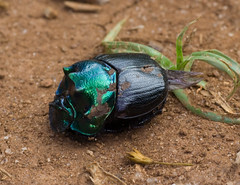 Superfamily: Scarabaeoidea; Scarab Beetles, Dung Beetles, etc. / Mestkevers, Vliegende Herten, etc.